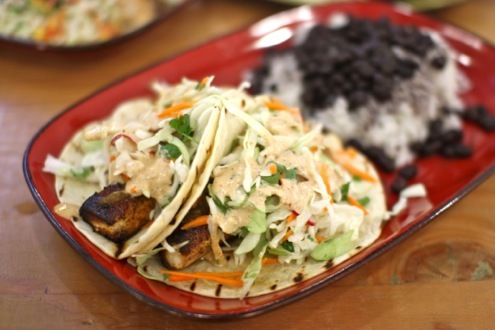 Rachel and I have always been fans of Fish Taco, the fast-casual taqueria tucked away in Cabin John. They recently opened a location in Wildwood Shopping Center in Bethesda so we decided to check out their newest site with the whole family. 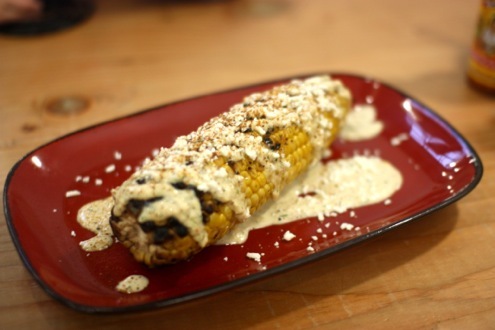 We kicked things off with the classic elote, or Mexican grilled corn. Topped with cotija cheese, guajillo chilies, and their signature sauce, it’s the quintessential starter. 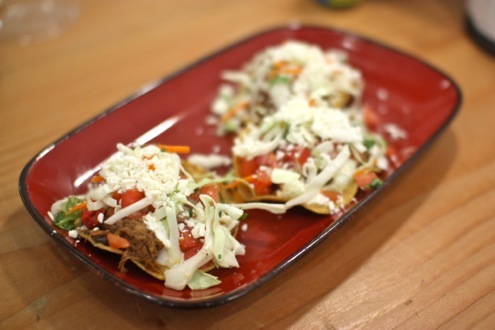 We also shared one of their special appetizers, beef brisket mini tostadas. The fried tortillas were stuffed with refried beans, pico de gallo, coleslaw, cotija, and crema. As you can tell by the description, they were indeed quite filling! As for entrees, it was rather self-explanatory given the restaurant’s name. I opted for the blackened fish taco platter. Topped with chili lime sauce, cabbage, and pineapple-chile relish, it always tends to be my go-to dish. Rachel got the grilled fish tacos which were topped with cabbage, mango pico, cotija, and chili lime sauce. 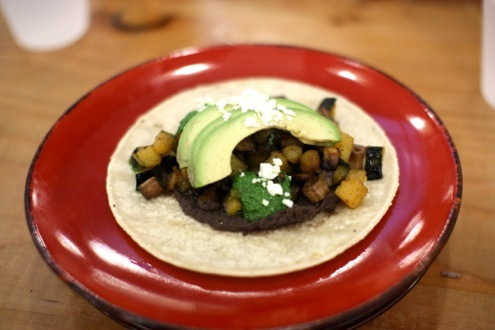 We also had the opportunity to sneak preview their autumn taco which featured black bean puree, acorn squash, avocado, and pesto that was prepared with pumpkin seeds and cilantro. It’s a seasonal delight that’s even vegan-friendly. 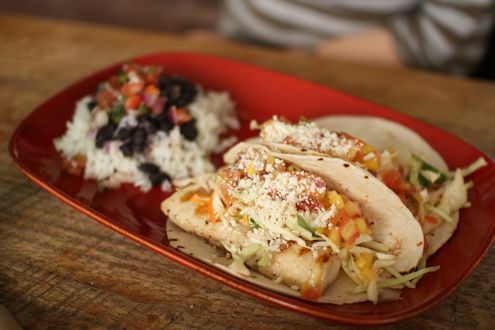 Fish Taco is one of those places where we’ve never had a bad meal, and being kid-friendly is always a plus. And now that they’re even closer to us with their new location, it’s a given that we’ll be visiting more often. Fish Taco is located at Wildwood Shopping Center in 10305 Old Georgetown Road in Bethesda, 7945 MacArthur Blvd in Cabin John, and 7015 Wisconsin Ave in downtown Bethesda. 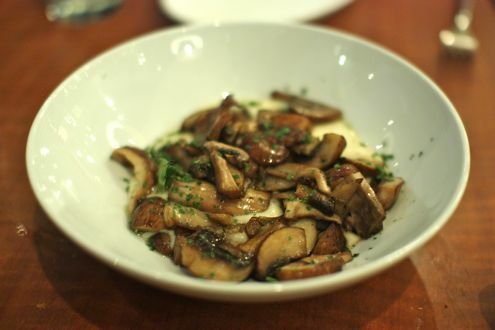 While downtown Bethesda isn’t necessarily devoid of pizza joints, the St. Louis-based pizzeria Pi Pizza is famously known for its deep-dish cornmeal crust pizza and adds a Midwestern flair that helps it stand out from its nearby counterparts. This is actually the second Pi in the Washington market as their D.C location, District of Pi, opened nearly three years ago in Penn Quarter. In the space that formerly housed Pitzze and its previous incarnation, Haven, Pi Pizza looks to welcome Bethesda diners with their trademark deep-dish pizza as well as an array of toppings that includes prosciutto, sundried tomatoes, roasted chicken, and even daiya vegan cheese. Since I was dining with my three year-old, I opted instead for the thin-crust style, as that was a bit more toddler-accessible as opposed to the deep-dish. The crust was delightfully crispy and incorporated a sweet tomato sauce without being overly greasy. Meanwhile, the biggest hit of the evening for my son was the meatballs. Incorporating a pork and beef blend and topped with tomato sauce and Parmesan, my kid gobbled these up… and even asked for seconds! And while the pizza is great, the oven-blazed wings are highly underrated. Prepared with a dry rub and baked in the oven (not fried! 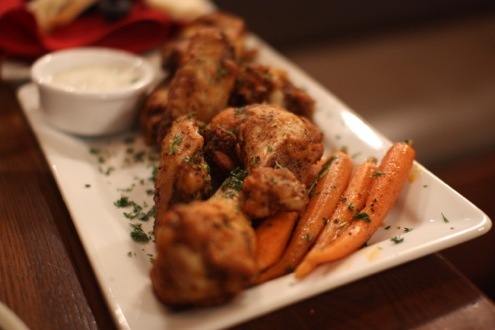 ), the wings were accompanied with a yogurt cucumber dressing which was a nice, refreshing twist compared to your typical ranch dip. Pi Pizza is a great addition to Bethesda, and with ample public parking in the back of the restaurant this looks to be a great destination for diners in search for a pie and a pint. 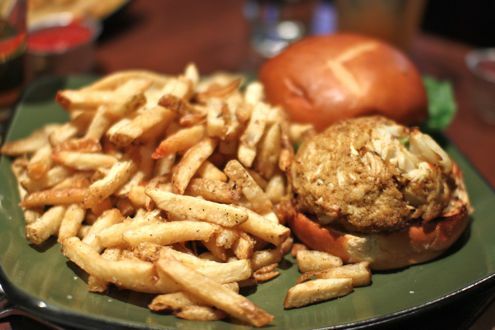 A few weeks ago we were invited to the soft opening of the second Maryland location of Not Your Average Joe’s in Bethesda off of Old Georgetown Road, the same address that once housed Hamburger Hamlet. As beloved as that restaurant was by locals, Not Your Average Joe’s is a substantial upgrade and then some. The 7,000 square feet space can accommodate up to 200 diners inside as well as an additional 75 patrons out on the patio. The New England-based chain prides itself on its reasonably-priced, seasonally-inspired menu, but it’s even more accommodating to gluten-free diners with an entirely separate menu which is certainly a nice touch. Meanwhile the bar area makes for a great gathering spot by offering 20 drafts on tap, with nearly half of the lines dedicated to “Backyard Brews” that feature local breweries such as DC Brau, Flying Dog, and Devil’s Backbone. 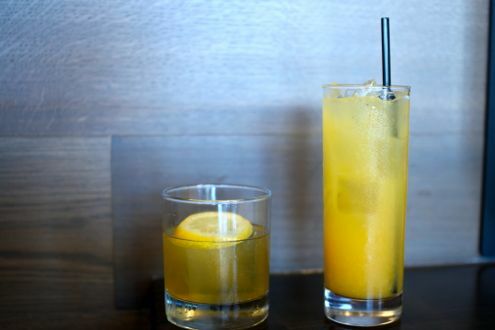 We started the evening off with a pair of refreshing summer cocktails – the Bulleit Bourbon Lemonade and Joe’s Margarita (the latter of which can be ordered “skinny” for those counting calories). The two of us split the ahi tuna wontons as an appetizer. 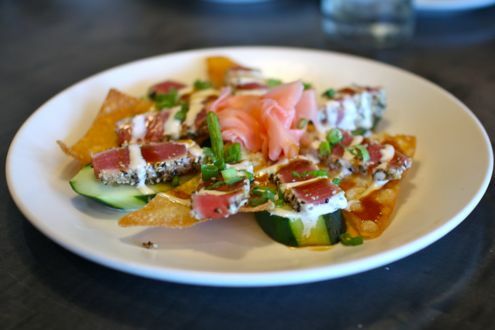 Topped with sesame-crusted tuna, pickled ginger, and wasabi aioli, diners have their preference of Japanese chili spiced crispy wontons or chilled cucumbers (we opted for the latter). For my entrée I went with the Vietnamese salmon, which was served in a large bowl of rice noodles, peanuts, vegetables, and lime-infused chili broth. Rachel got the herb-crusted, pan-seared haddock that was accompanied with a parmesan-cauliflower mash, green beans, and tartar sauce. 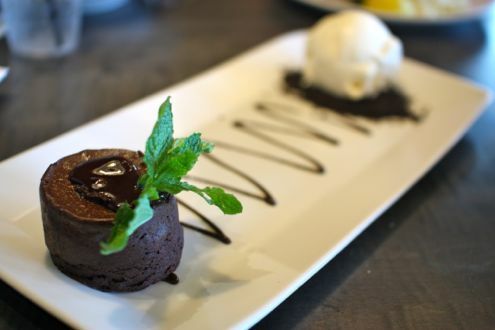 We concluded the evening with the classic molten chocolate cake, because who doesn’t love warm, gooey cake and vanilla ice cream? Between the great location and accessible menu, Not Your Average Joe’s makes for a solid dining option whether you’re going out as a couple, family, or large party. And with a Silver Spring location on the horizon, the restaurant appears to have a winning formula. Rachel and I have been to City Burger several times and have really enjoyed Chef Michael Harr’s burgers since opening back in May. The executive chef at nearby Food Wine and Co, Harr has now expanded his menu including a revamped version of their veggie burger as well as a variety of hot dogs and hand-spun shakes featuring house-made custard. 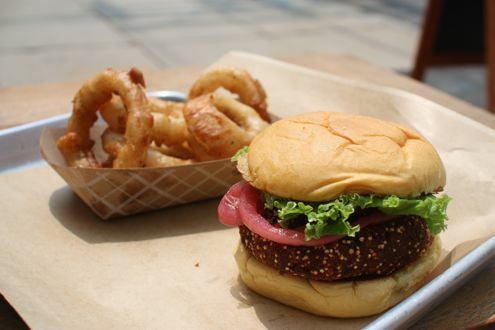 The new version of the veggie burger (the previous incarnation was basically a fried cheese patty), cleverly dubbed the Herban Garden, is a blend of fried quinoa and black bean, and topped with lettuce, pickled red onion, and herby mayo. The result is a crunchy, satisfying alternative to its beefy counterpart. 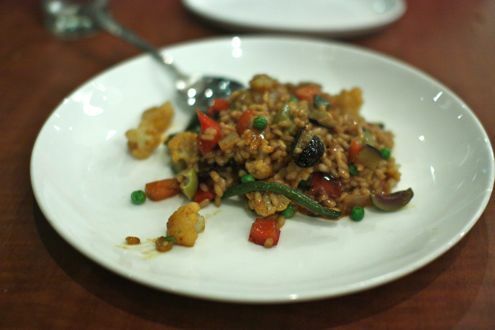 It’s comparable to the famous veggie burger at Woodmont Grill, just half the price. We both particularly enjoyed the pickled onions since it was not only a unique topping but really complemented the crispy veggie patty. And while turkey burgers aren’t certainly exciting on paper when beef reigns supreme, Harr’s version delivers. 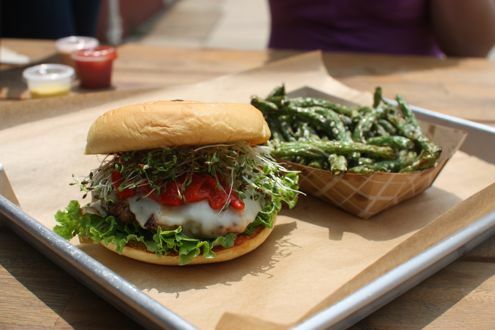 The Suburban features a seasoned turkey patty topped with a slice of Swiss, roasted peppers, alfalfa, avocado, lettuce, and herby mayo. For a white meat alternative, it’s one of the better turkey burgers we have come across. Oh, and it pairs up nicely with a side of fried green beans, which are sprinkled with Parmesan and sesame seeds. Of course you can’t go wrong with their crispy sea salt fries, but it’s nice to see a greener alternative. One of the most intriguing additions was the Brooklyn Deli burger. 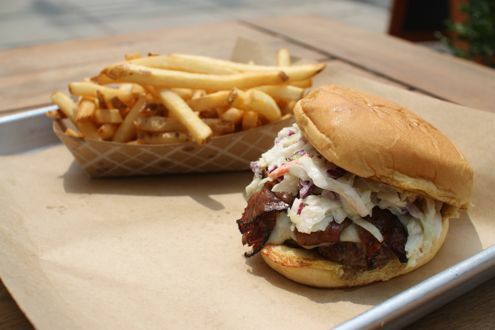 A succulent beef patty is topped with Swiss cheese, crispy pastrami, coleslaw, and deli mustard. It’s like pastrami on rye after taking my first bite. The ingredients work effortlessly well together, especially the pastrami and bright yellow mustard. And while it’s a little on the greasier side (I mean it’s fried pastrami after all), it’s a nice take on burger meets delicatessen. And then there’s the hand-spun shakes. 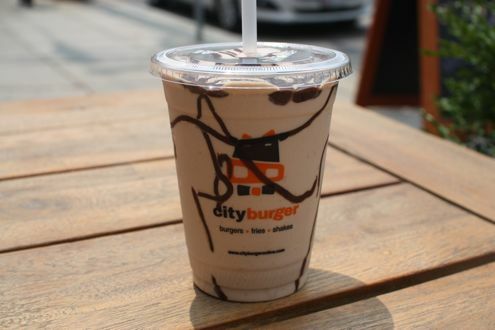 Prepared with rich, thick custard made in-house, City Burger has not one but six different specialty shakes (in addition to the traditional vanilla, chocolate, and black & white preparations). Rachel tried the City Slicker, which was made with vanilla custard, Nutella, banana, chocolate sauce, and salted caramel. 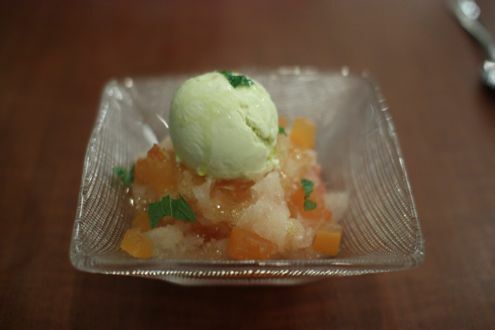 It was just as delicious as it sounded and was quite refreshing for a summer treat. I opted for the D.C. Grasshopper – chocolate custard, mint Oreo cookie, and mint chocolate. The mixture was heavenly, so much so that a spoon is recommended as you’re going to run out of oxygen using a straw given how deliciously thick the custard is. 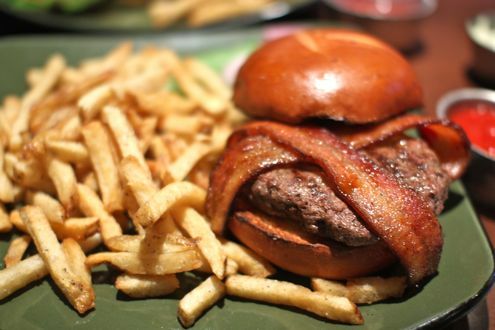 City Burger is a great addition to Bethesda, and as you can tell, isn’t just another burger joint. We’re big fans of Food Wine and Co. in downtown Bethesda, so when we heard the news that the owners as well as executive chef Michael Harr would be opening a taqueria in Cabin John, we obviously had to check it out. Located in MacArthur Plaza, Fish Taco is a little more upscale than your typical taqueria given the locale, but the food is well worth the trip to this suburban alcove. 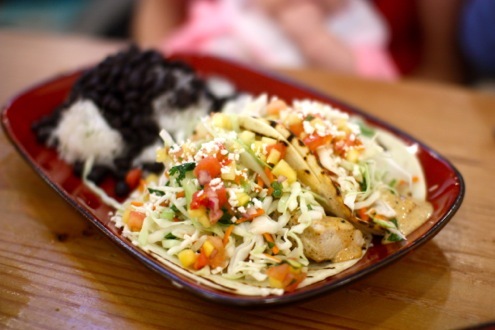 Fish Taco is a fast-casual format where diners order and pay for their tacos at the counter, then wait for their food to be served at their table. The menu, however, goes well beyond this Mexican staple. Offering an array of rice bowls, quesadillas, burritos, and salads, there’s enough variety for even the pickiest of eaters. There’s even a kids menu, which worked out well for our toddler who devoured his cheese quesadilla. Rachel and I started things off with their grilled corn on the cob, otherwise known as Elote. 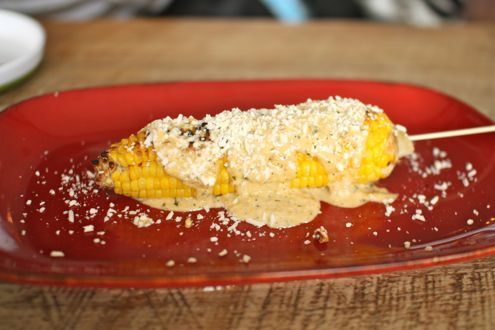 Topped with cojita cheese and situated in a bed of their signature sauce, the corn was sweet, crunchy, and downright delicious. Highly recommended dish. 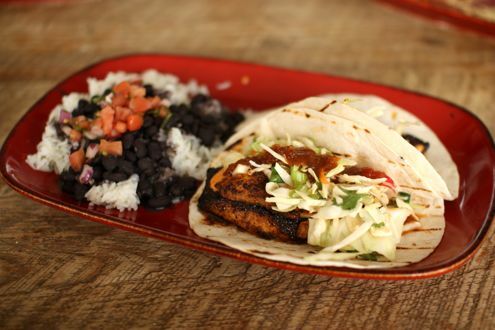 As for our entrees, I opted for the blackened tilapia tacos. Served on a flour tortilla, the tilapia wasn’t anything remarkable (it’s tilapia, after all), but topped with the kitchen’s chili lime mayo, crispy cabbage, mango pico, and cotija cheese, as well as a side of rice and beans, it made for an enjoyable if not filling meal. Rachel ordered the grilled mahi mahi tacos, and after having a bite of hers, I slightly preferred her dish over mine. Maybe it’s because mahi mahi is a more flavorful fish than tilapia, or that it’s a little firmer, but overall both tacos were just fine. I should note that Fish Taco sells its tacos in pairs, so bear that in mind. And not that it’s a bad thing, but if you’re looking to sample a variety of tacos from Fish Taco, it’s probably best to come with a larger party so you can share them all. The pricing is fair if not a tad pricey – it just depends on what you order. For example, their beef, pork, and chicken tacos range from seven to nine dollars, but if you’re opting for fish, those start at $10. 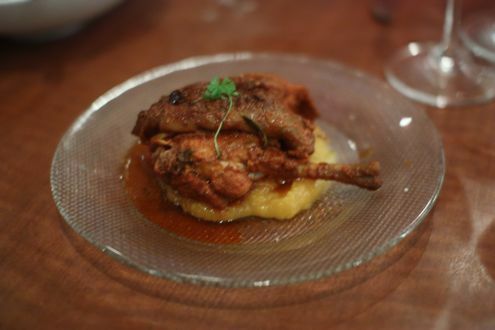 But given the quality of the food, we didn’t have any qualms about our bill. Overall we were very pleased with our meal at Fish Taco. It’s especially great during the spring and summer months as there is plenty of outdoor seating, not to mention it is super kid-friendly to boot. 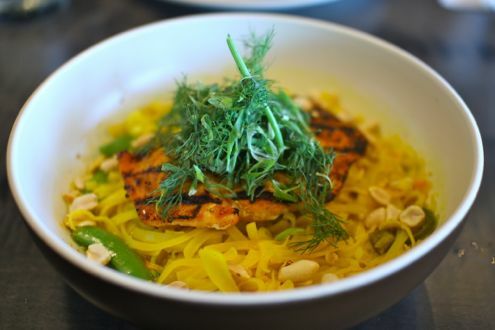 Now that we are officially less than a week away from Passover, we thought we would take the time to compile a list of DC area restaurants that will be offering Pesach-friendly menus. BLT Steak: A new entrant in the Passover scene, the DC steakhouse is offering some intriguing items such as deviled hen eggs with challah croutons and pike “gefilte” fish with English pea velouté. Guests can order items a la carte or create their own three-course menu for $60 per person. The menu runs from Monday, April 14 to Saturday, April 19. Call 202-689-8999 to make a reservation. 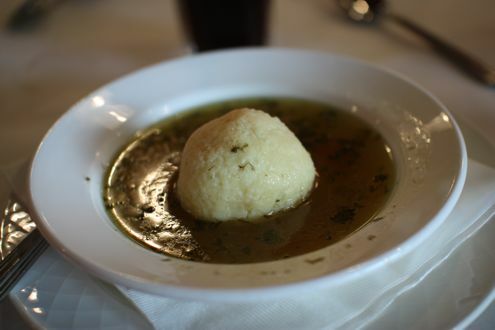 Commissary: The Logan Circle eatery is offering one of the more affordable Passover-centric dining options with a $28 prix-fixe three course dinner that includes matzo ball soup, brisket, and sweet matzo kugel. The menu is also available a la carte and will be available from Monday, April 14 to Saturday, April 19. Call 202-299-0018 to make a reservation. Fiola: Chef Fabio Trabocchi introduces his “Passover Seder All’Italiana” with an exquisite six-course tasting menu that will be offered from Tuesday, April 15 to Tuesday, April 22. The dinner will feature an Italian twist on the Passover Seder with items such as baby artichokes salad, red mullet and fennel risotto, and a kosher rack of lamb. The dinner is $105 per person along with an optional $60 wine pairing. Call 202-628-2888 to make a reservation. DGS Delicatessen: Already one of the most popular restaurants in Dupont Circle, Barry Koslow’s kitchen will be featuring a spit-roasted lamb dinner for the first night of Passover on Sunday, April 13. The menu will feature spit-roasted lamb served family style, along with latkes, roasted beets, asparagus, and honey glazed donuts for $35 per person. Additionally, DGS will be offering a “Seder at the Delicatessen” four-course dinner from April 14 to 21 for $45/person, and will feature matzo ball soup, pan-roasted striped bass, Shenandoah Valley lamb, and charoset cake. There is also a $20 optional wine pairing. Call 202-393-4400 to make a reservation. Equinox: Chef Todd Gray will be offering a farm-to-Seder party on Monday, April 14. Featuring recipes from Todd and Ellen Gray’s cookbook, The New Jewish Table: Modern Seasonal Recipes for Traditional Dishes, the $90 dinner will include matzo ball soup, short rib, and pineapple upside down cake. Call 202-331-8118 to make a reservation. Rosa Mexicano: It’s Mexican Passover over at Rosa Mexicano from Monday, April 14 to Tuesday, April 22. Their Penn Quarter, Chevy Chase, and National Harbor locations will feature a “Passover a la Mexicana” menu which puts a south of the border twist on traditional favorites. From tropical haroset to chipotle-marrow matzo balls, Rosa Mexicano offers perhaps the most eclectic selection of Passover dishes thus far. Menu is prix-fixe. 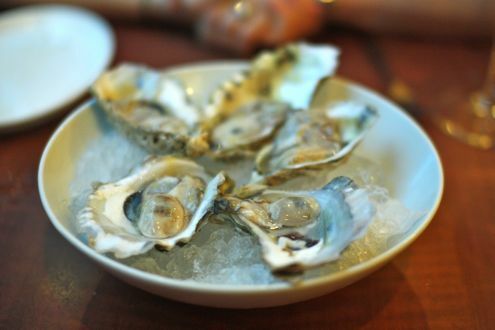 Call 202-783-5522 (Penn Quarter), 202-777-9959 (Chevy Chase) or 301-567-1005 (National Harbor) to make a reservation. Mon Ami Gabi: The French bistro located in downtown Bethesda will be offering a prix-fixe Seder menu on Monday, April 14th and Tuesday, April 15th. Dinner will feature classic Passover dishes such as matzo ball soup, chopped liver with egg and onions, and beef brisket. Rachel and I went a couple of years ago and really enjoyed it. $36.95 for adults and $15.95 for children under 12. Call 301-654-1234 to make a reservation. 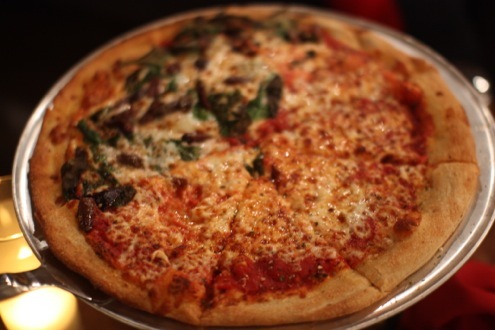 Vince & Dominic’s Pizzeria: Just because it’s Passover doesn’t mean you can’t eat pizza. The Bethesda-based pizzeria will be serving up unleavened pies all throughout Passover. Make sure to place your orders ahead of time as demand will be high during the holiday. Call 301-365-4190 to place your order. Georgetown Cupcake: DC’s most famous cupcake outpost will be selling a variety of Passover Macaroon cupcakes at both their Georgetown and Bethesda locations. These flourless coconut macaroon cupcakes will be available with either caramel or chocolate drizzle. Sprinkles: The latest cupcake import from Beverly Hills will be selling flourless chocolate cupcakes, topped with a blue Star of David naturally, from April 14 to 22. 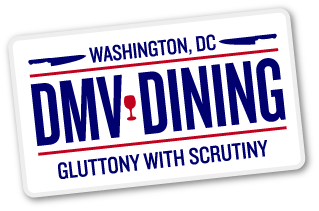 If you know of any area restaurants not listed above that are offering Passover menu options, please let us know by either leaving a comment or emailing us at dmvdining AT gmail DOT com. 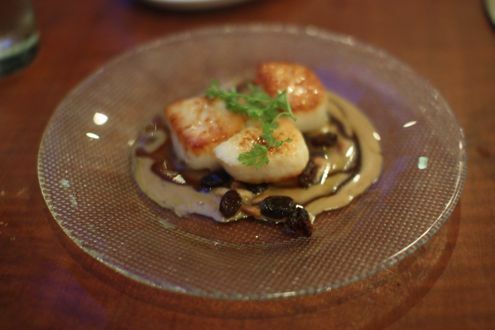 DGS Delicatessen: Already one of the most popular restaurants in Dupont Circle, Barry Koslow’s kitchen will be featuring a four-course prix-fixe Seder menu from Monday, March 25 to Sunday, March 31. 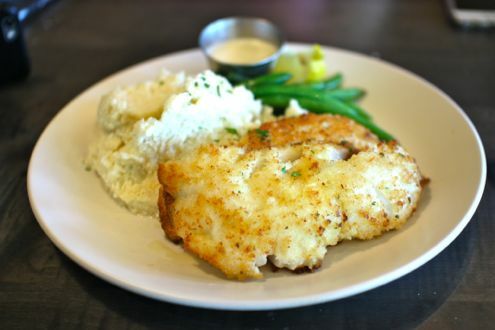 Featuring housemade matzo and bitter herb crusted halibut, this isn’t your bubby’s typical Seder. $40 per guest with optional $20 beverage pairing. Call 202-393-4400 to make a reservation. Dino: The Cleveland Park restaurant continues its time-honored tradition of offering a Passover menu starting Monday, March 25 through Monday, April 1. Not only will Dino be opening early the first two days of Passover to allow diners enough time to get to services, but they will also lend you a Seder plate as well! 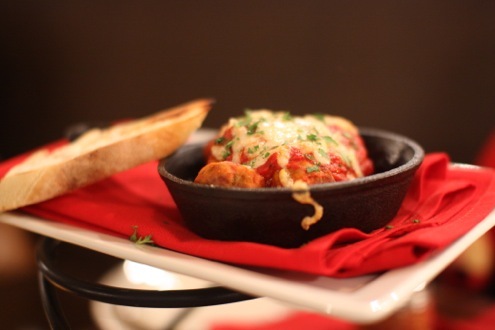 The prix-fixe menu features four courses which include a choice of entrees served family-style. $59 for adults and $25 for children. 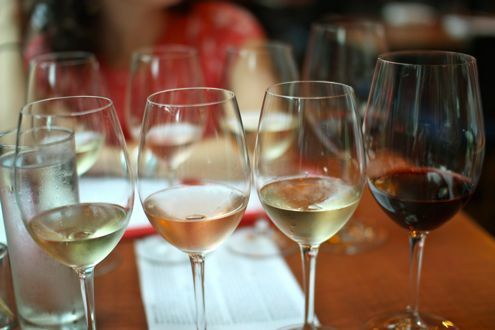 Flight of four glasses of wine (non-kosher) is an additional $29 per person. Call 202-686-2966 to make a reservation. Equinox: Chef Todd Gray will be offering a Passover menu from Monday, March 25 to Tuesday, April 2. 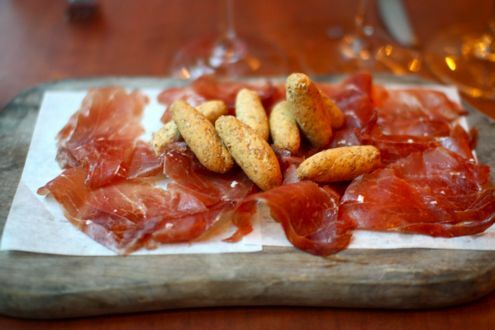 The five-course prix-fixe dinner will include items such as quinoa salad with figs and mint, as well as Todd’s Modern Day Brisket (the recipe can also be found in their new cookbook, The New Jewish Table: Modern Seasonal Recipes for Traditional Dishes). 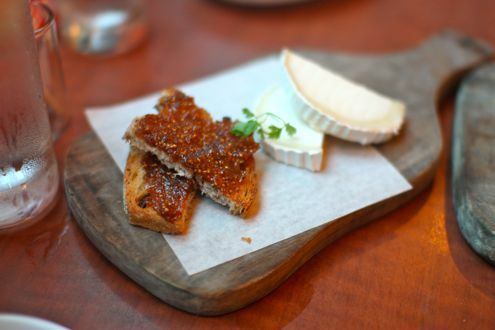 $45 for adults, $60 with boutique Israeli wine pairing. Call 202-331-8118 to make a reservation. Rosa Mexicano: It’s Mexican Passover over at Rosa Mexicano from Monday, March 25 to Saturday, March 30. Their Penn Quarter, Chevy Chase, and National Harbor locations will feature a “Passover a la Mexicana” menu which puts a south of the border twist on traditional favorites. From tropical haroset to chipotle-marrow matzo balls, Rosa Mexicano offers perhaps the most eclectic selection of Passover dishes thus far. Menu is prix-fixe. $42 per guest. Call 202-783-5522 (Penn Quarter), 202-777-9959 (Chevy Chase) or 301-567-1005 (National Harbor) to make a reservation. Mon Ami Gabi: The French bistro located in downtown Bethesda will be offering a prix-fixe Seder menu on Monday, March 25th and Tuesday, March 26th. Dinner will feature classic Passover dishes such as matzo ball soup, chopped liver with egg and onions, and beef brisket. Rachel and I went a couple of years ago and really enjoyed it. Vince & Dominic’s Pizzeria: Just beacuse it’s Passover doesn’t mean you can’t eat pizza. The Bethesda-based pizzeria will be serving up unleavened pies all throughout Passover. Make sure to place your orders ahead of time as demand will be high during the holiday. Georgetown Cupcake: DC’s most famous cupcake outpost will be selling a variety of Passover Macaroon cupcakes at both their Georgetown and Bethesda locations. These flourless coconut macaroon cupcakes will be available with either fudge or dulce-de-leches drizzle. Sprinkles: The latest cupcake import from Beverly Hills will be selling flourless chocolate cupcakes, topped with a blue Star of David naturally, from March 25 to April 2. 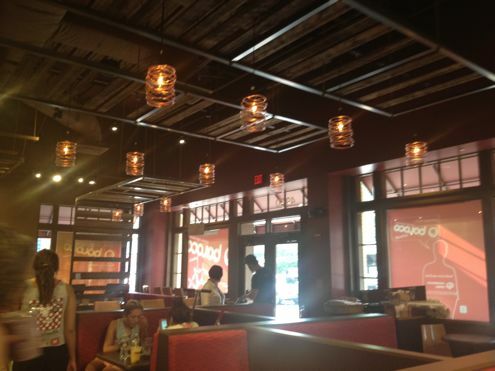 Yet another addition to the growing list of fast casual eateries in downtown Bethesda, Boloco will open its doors on Thursday, July 19th. I had a chance to take a sneak peak at this Boston-based burrito company last night, and Boloco already seems like a great addition to the neighborhood. When you walk into Boloco, you have the choice of either ordering from staff at the counter or placing your order at a computer kiosk. 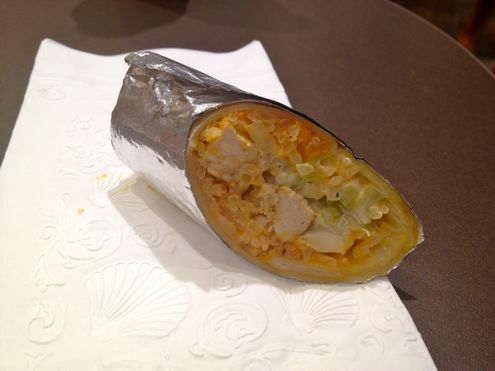 The general concept is “globally inspired burritos”, and you have the option of choosing the type of burrito or bowl you want, and then adding your protein. The choices range from Buffalo to Tikka Masala to Bangkok Thai, and you can pair them with chicken, steak, carnitas, tofu, or fajita veggies. When you think burritos, you generally think Mexican, but there is only one traditional option listed. We were told last night that there is also an off-the-menu option called the Yucatan Habanero, which consists of pickled onions, black beans, sour cream, boloco rice, and hot habanero salsa. Apparently you can add that salsa to any burrito as well. There are also cold options, such as the Mediterranean, which features hummus, black bean hummus, feta cheese, and cucumbers. And, if you really just want to make your own, you can pick the tortilla, protein, base of rice or lettuce, beans, sauces, veggies, and cheese. I was overwhelmed enough looking at the menu, and was assured that the staff can recommend which protein goes best with which burrito. Speaking of options, there are also sizes to think about. You can get the original, which is about the size of what you would get at Chipotle, the small, which is about 2 inches smaller, or the mini, which is more of a snack then an actual meal. You can also get a mini bundle of two different burritos, being able to mix and match different choices. 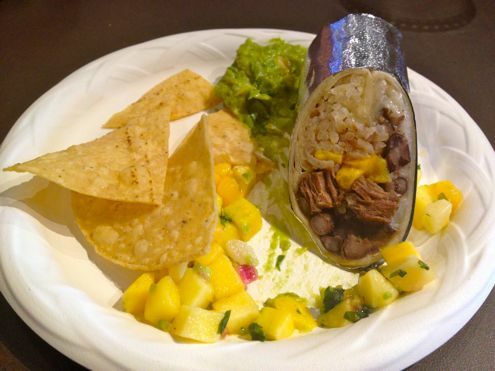 In addition to their main line of burritos, Boloco also offers sides of chips and guacamole or salsa, desserts, and an extensive menu of smoothies and shakes. I tried several of them, and my favorites were the Mango Passion, the Nutella Milkshake, and the Jimmy Carter shake of peanut butter, banana, and ice cream. You really can’t go wrong with those ingredients. Those again come in an original, small, and mini size. Considering that the space used to be a Baja Fresh, the look itself is impressive. 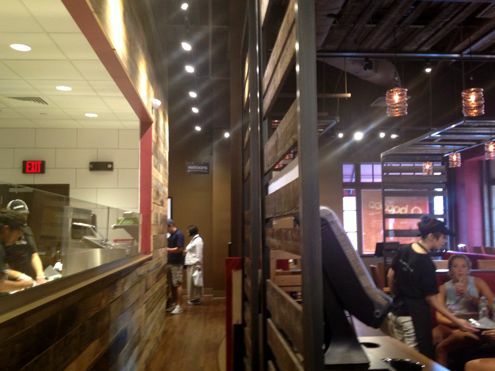 As you head towards the bathrooms, you can read the story of how Boloco came to be. They started out as a wrap company with numerous chains throughout the Boston area, but eventually changed the name after market research showed that people began to have a negative connotation with wraps. So essentially to get a better idea of what this place offers, think warm and cold wrap sandwiches instead of another Chipotle or Qdoba, since that’s really what it is. 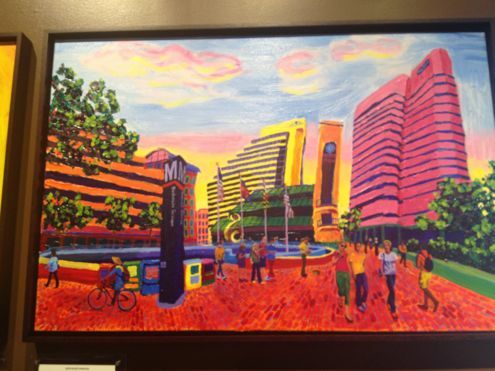 There is also wonderful artwork in the bathrooms showing different scenes in Boston, but even better are the two pieces of artwork right by the order counter by a local artist showing downtown Bethesda. 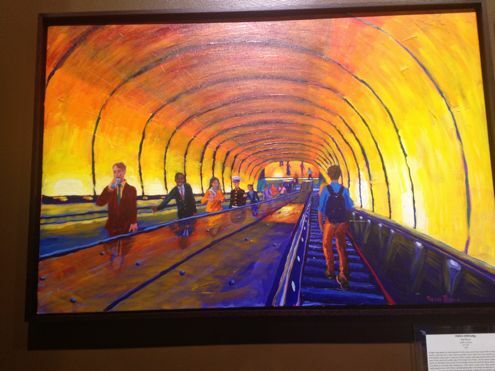 One illustrates the Metro entrance while the other is of people going up and down the Metro escalator. The concept itself reminds me of Cava Grill where you can build your meal, and they also have adopted green practices by offering options for recycling and composting. They have a passion of giving to local communities, and have specials each month where if you order certain items, a dollar of the proceeds goes to the charity Bethesda Green. I can definitely see myself either getting a small burrito, or getting a mini burrito and a mini smoothie and turning that into a meal. The prices are fairly reasonable, or at least on par with the other comparable establishments in Bethesda. This is their first location outside of New England, and other locations are planned this year for Dupont Circle and Georgetown. 7141 Wisconsin Avenue has hosted many restaurants throughout the years. Located next to the Montgomery Farm Women’s Cooperative Market, this address has seen a handful of venues open and close, Vegas Bar & Grill and Gaffney’s being the latest causalities. The Majestic, which opened a few months ago, hopes to buck that trend. Rachel and I met up with The Bethesda Foodie and her husband in what was to be our first blogger meal together. The Majestic bills itself as a “gastropub”, but when looking over the menu, it’s a mish-mosh of pub fare, small plates, and even ramen. With the Caps game broadcast on the restaurant’s two flat screen TVs above the bar, the guys kept things simple with burgers and beers while the wives both ordered crab cake sandwiches. Speaking of beers, The Majestic has a pretty good beer selection, with local breweries Heavy Seas and Flying Dog on-tap. I asked for the chopped sirloin burger to be cooked medium and topped with bacon (of course). When the plate arrived, it was nearly overflowing with the kitchen’s delicious hand cut fries. The burger itself wasn’t bad, although it was cooked more on the well side. Thankfully, the nicely-seasoned patty gave it enough flavor that it wasn’t much to make a fuss about. Oh, and the thick slabs of bacon helped, too. Rachel liked the crab cake overall, but while the waitress said there was little filler, there was definitely some extra seasoning or binding that made it fall apart and took away from the crab itself. All she could taste was mustard, and after starting to eat it with the bun, Rachel wound up picking at the crabcake itself since the bun overpowered it. Overall, The Majestic seems like a nice place to meet for happy hour or if you’re looking for some traditional pub fare. The oxtail wontons and ramen seem a bit out of place when you’re also serving up poutine and chicken wings, but we’ll have to come back and eventually try those dishes out. Either way, it seems like a nice, low-key spot in a very good location. Hopefully it sticks around.